It’s no secret, Ontario faces significant fiscal challenges including a large budget deficit and large debt burden. 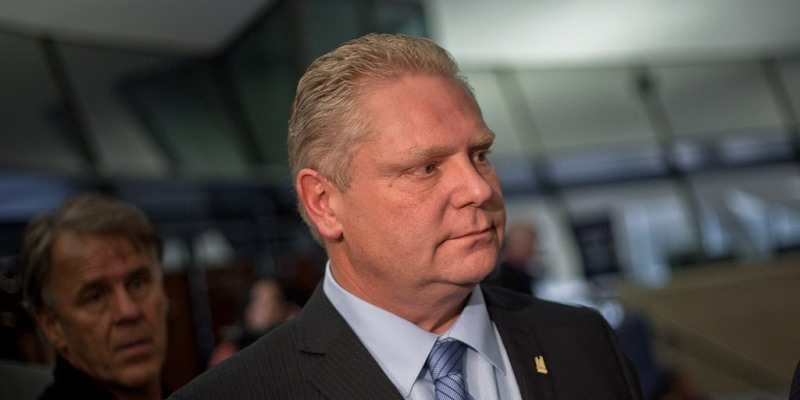 As the Ford government prepares to table its 2019 budget, it must continue to look for ways to rein in program spending, which is the key source of Ontario’s fiscal problems. In these efforts, the government should scrutinize the compensation of government employees, which consumes roughly half of all program spending. How much room for savings exists in this area? It’s a complicated question to answer, but we can compare the wages paid to government-sector workers with the wages of comparable workers in the private sector. Recent Fraser Institute research shows that, after controlling for important variables such as age, education, experience and so forth, government-sector workers enjoy a substantial pay premium compared to similar employees in the private sector. In fact, the study shows that after controlling for these factors, the government-sector wage premium in Ontario is approximately 10.6 per cent on average. Moreover, it’s important to recognize that wages do not represent the whole of compensation—there are other dimensions to total compensation, which further contribute to the premium enjoyed by government workers. For example, government-sector employees are more likely (on average) to have registered pensions via their workplace, retire earlier, enjoy greater job security and take more days off of work each year than their private-sector counterparts. The table below illustrates one of these advantages, showing the average retirement age from 2013 to 2017 for workers in the government sector compared to the private sector. It shows that (on average) government-sector workers retire 2.4 years earlier than workers in the private sector. In Ontario, the gap is slightly smaller but still substantial, as government-sector workers retire 1.8 years earlier than private-sector employees. It won’t be easy for Ontario to climb out of such a deep fiscal hole. 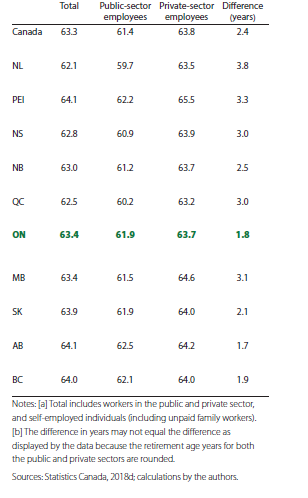 Given the state of Ontario’s finances, it’s important to scrutinize all dimensions of provincial government spending including spending on the wages and salaries of government-sector employees—which again, consumes half of all spending.